When Katharine Briggs — a mother and homemaker — began what she called a "cosmic laboratory of baby training" in her Michigan living room in the early 1900s, she didn't know she was laying the groundwork for what would one day become a multi-million dollar industry. Briggs was just 14 years old when she went to college, and ended up graduating first in her class, explains author Merve Emre. She married the man who graduated just behind her at No. 2 — and while he became a scientist, she was expected to take care of the home. "This incredibly educated woman — who was never expected to do anything but be a wife and a mother — she wanted to figure out how to take those roles and professionalize them," Emre says. "She wanted to figure out how she could do something in her home that would be as rigorous and as important as what everybody thought her husband was doing in his laboratory." So Briggs began studying children and, along with her daughter Isabel Briggs Myers, created what became known as the Myers-Briggs Type Indicator. The test is a series of questions designed to reveal a person's core personality type: Are you an extrovert or introvert? Sensing or intuitive? Thinking or feeling? Judging or perceiving? The intersection of these traits reveals one of 16 different "types" of personalities. The test hasn't held up scientifically, but over the latter half of the 20th century the "people sorting" questionnaire was widely embraced by major companies, the U.S. government, and the culture at large. Emre traces the origins of the test in her new book The Personality Brokers. What she started to do was to gather the neighborhood children in her home and test their personalities. She wanted to help them design programs of education that would help each one of them individually self-actualize. So she started by giving their parents a questionnaire — a forced choice questionnaire, which meant there were only two answers, A or B, and you had to choose one. They asked parents questions like: Is your child calm or impulsive? Does he get upset very often or rarely? Does he sleep in your bed at night or sleep by himself? And from these questionnaires she devised her first set of different personality types of children — this was the origin for the Myers-Briggs Type Indicator as we know it today. She spends so much of her adult life caring for children — both hers and others' — that when her only daughter Isabel goes off to school, she falls into this very deep depression because she doesn't know what to do with her life. And it's during that depression that she first reads Carl Jung's Psychological Types and becomes absolutely devoted to it. ... She strikes up a correspondence with him where she asks him to tell her what he means by "intuitive" or what he means by "feeling" — and how it is that she can take these somewhat abstract categories that he's devised and use them to actually help the people in her life figure out what type they are and how to be the best type of person they can be. For [Katharine] it was really a spiritual quest. ... She was a deeply religious woman and she believed that the only way to really save your soul was to figure out who you were, and to live life according to that best version of yourself. Isabel, her daughter, inherits this language of type a little bit later on, right around World War II. Isabel thinks about the language of type that she has been hearing from her mother for the past 20 years and she thinks: What if I could design a questionnaire that would help fit people to the jobs that were best suited for them? I could do it using this language of type which wouldn't separate people into categories of "normal" or "abnormal," "good" or "bad" workers, but would just say that every type of person is different and every different type has different strengths, and different weaknesses, and are better suited to doing some things over others. So that's where the Jungian theories that Katharine has been obsessed with, that's where they become this practical instrument of what Isabel calls "people sorting." You see it sort of land in the government. ... In the late '50s it's purchased by universities like Berkeley and Swarthmore that are trying to figure out how to use personality testing in their admissions processes. Slowly, over time, it circulates in wellness centers, in hospitals, among the clergy — and it just sort of creeps into all of the major institutions that shape our everyday lives. Where it really, really takes off is in corporations. After Isabel Briggs Myers dies in the 1980s ... one of the things that you see in corporations is a new push to try to help workers figure out how to love what they do — how to be as content doing their work as they are at home. And I think there, the type indicator emerges as this incredibly useful tool for convincing people that they are doing exactly what it is that they are meant to do — and that they should bind themselves to their work freely and gladly. Katharine Briggs thought about it as a parenting tool, you know? These are times where our lives take on a kind of messiness and we just want something to anchor us in these moments of complexity or confusion. I think the language of type can be immensely clarifying. Even though I'm skeptical of its validity, and I'm skeptical of its social uses, and even of the language that it uses, I am not skeptical of people's individual experiences with the indicator which I think can be tremendously liberatory. I think it is a very comforting fiction that is offered to people. On the one hand, believing that there is something innate or essential about who you are means that you don't have to apologize for who you are — that just is who you are. I think many of us grow up — or at least I did — thinking that who I was was the sum total of what I had accomplished. I think it really shifts you away from that language of accomplishment toward a language of the self. ... I think that can be an incredibly comforting fantasy and one that, on the plus side, can make you feel like you can be the master and arbiter of your own destiny. You can live life according to who you are and your own conditions not according to anybody else. On the other hand, I think it can make you feel like you don't have to take responsibility for changing. Katharine would have been appalled. She was never a fan of Isabel actually transforming her theory of types into a questionnaire in the first place. She believed that she had spent so much of her life studying Jung and that the only way you could really type somebody was being initiated into his thinking over a very long period of time. She was skeptical of the questionnaire from the get-go. I think Isabel Briggs Myers would also be quite disappointed and I think she would have felt quite sad by how people can just take knock-off versions of it online, how quizzes like BuzzFeed quizzes basically parody the logic of type, by asking you "Which Taylor Swift song reveals something about which Friends character you might be." And I think she would be quite disappointed by how loosely and in what an unregulated fashion the indicator was allowed to circulate. Gemma Watters and Natalie Winston produced and edited this interview for broadcast. Beth Novey adapted it for the Web. In the early 1900s, a housewife in Michigan started studying young children in her living room. She called it a cosmic laboratory of baby training. From that inauspicious beginning sprang something that is now a multimillion-dollar industry. The housewife was Katharine Briggs. She and her daughter, Isabel Briggs Myers, created what became known as the Myers Briggs Type Indicator. It's a personality test or people-sorting device, a series of questions designed to reveal just who you are - an extrovert or introvert, sensing or intuitive, thinking or feeling, judging or perceiving - one of 16 total personality types. 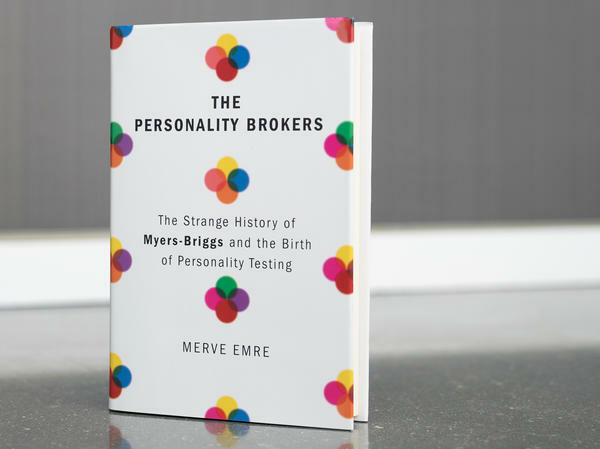 Writer Merve Emre digs into the origins of all this in her new book "The Personality Brokers: The Strange History Of Myers-Briggs And The Birth Of Personality Testing." And she joins me now from the BBC in Oxford, England. Merve Emre, welcome to the program. MERVE EMRE: Hi. Thank you for having me. BLOCK: And let's talk about these two characters, Myers and Briggs. They're not scientists by training. They were two housewives, mother and daughter. What was it that Katharine Briggs was trying to do in that first living room study with those children? EMRE: Well, Katharine was an exceptional woman. She had gone to college at the age of 14, and upon graduating, she graduated No. 1 in her class and married the man who was No. 2. And there was never any assumption that she would go on to do anything professional with her life. When she graduated, her mother gave her husband $200 for his graduate education and gave her a chest full of linens to decorate their new home. And she wanted to figure out how she could do something in her home that would be as rigorous and as important as what everybody thought her husband was doing in his laboratory. He was a scientist. And so what she started to do was to gather the neighborhood children in her home and test their personalities. She wanted to help them design programs of education that would help each one of them individually self-actualize. So she started by giving their parents a forced choice questionnaire, which meant there were only two answers - A or B - and you had to choose one. And they asked parents questions like, is your child calm or impulsive? Does he get upset very often or rarely? Does he sleep in your bed at night or sleep by himself? And from these questionnaires, she devised her first set of different personality types of children. And this was the origin for the Myers-Briggs Type Indicator as we know it today. BLOCK: So she's very analytical about this. And then Katharine Briggs discovers the work of the Swiss psychoanalyst Carl Jung and his personality types, and she becomes completely obsessed. EMRE: She does. You know, she spends so much of her adult life caring for children, both hers and others, that when her only daughter Isabel goes off to school, she falls into this very deep depression because she doesn't know what to do with her life. And it's during that depression that she first reads Carl Jung's "Psychological Types" and becomes absolutely devoted to it. And she starts writing to him. She strikes up a correspondence with him where she asks him to tell her what he means by intuitive or what he means by feeling and how it is that she can take these somewhat abstract categories that he's devised and use them to actually help the people in her life figure out what type they are and how to be the best type of person they can be. BLOCK: Her daughter, Isabel Briggs Myers, gets involved. What was the practical idea behind this typing? What were they trying to do? EMRE: When Katharine first discovered Jung and became attracted to his idea of type, for her, it was really a spiritual quest. She was a deeply religious woman. And she believed that the only way to really save your soul was to figure out who you were and to live life according to that best version of yourself. Isabel, her daughter, inherits this language of type a little bit later on, right around World War II. And Isabel thinks about the language of type that she has been hearing from her mother for the past 20 years. And she thinks, what if I could design a questionnaire that would help fit people to the jobs that were best suited for them? And I could do it using this language of type which wouldn't separate people into categories of normal or abnormal, good or bad workers, but would just say that every type of person is different, and every different type has different strengths and different weaknesses and are better suited to doing some things over others. BLOCK: So how did this personality sorter, this people sorter that was dreamed up by these two women, how did it take off and become the huge industry that it ultimately is? EMRE: Well, it takes off slowly in a creeping sort of way. So initially, the first person to ever purchase the indicator is the - one of the directors of a station of the OSS, the precursor to the CIA. And he purchases it so he can figure out how to match covert operatives during World War II to the secret missions that are best suited to their personalities. Slowly, over time, it circulates in wellness centers, in hospitals. And it just sort of creeps into all of the major institutions that shape our everyday lives. Where it really, really takes off is in corporations after Isabel Briggs Meyers dies in the 1980s or so. In the 1980s, one of the things that you see in corporations is a new push to try to help workers figure out how to love what they do. And I think there, the type indicator emerges as this incredibly useful tool for convincing people that they are doing exactly what it is that they are meant to do and that they should bind themselves to their work freely and gladly. BLOCK: Yeah. Clearly, in your book, you have a great deal of skepticism for the validity of the test. It's been shown to be scientifically unsound. But it is a huge moneymaker, a big, big industry. Why do you think so many of us are drawn to personality tests like the MBTI? EMRE: Well, I think what makes the MBTI so compelling and so seductive is that it offers us a really easy and non-judgemental language of the self. It offers us a vocabulary to talk about who we are and what our desires are. And it doesn't make us feel like we have to apologize for those desires. And I think there is just a real hunger for self-knowledge, particularly at times of great transition. So I don't think it's an accident that many of the people who encounter the indicator encounter it for the first time in couples counseling, when they're starting a job, when they're trying to decide if they want to leave a job or not, when they're going off to college, or even that Katharine Briggs thought about it as a parenting tool, you know. And so I think the language of type can be immensely clarifying. And even though I'm skeptical of its validity, and I'm skeptical of its social uses and even of the language that it uses, I am not skeptical of people's individual experiences with the indicator, which I think can be tremendously liberatory. BLOCK: One of the things - one of the rules of type, as it's put here, is that type is supposed to be immutable, unchanging. It's something you have since birth, and it stays with you for the rest of your life. Do you think that's legitimate? EMRE: No, I don't think that's legitimate at all. But I think it is a very comforting fiction that is offered to people. On the one hand, believing that there is something innate or essential about who you are means that you don't have to apologize for who you are. That just is who you are. And I think many of us grow up, or at least I did, thinking that who I was was the sum total of what I had accomplished. And I think it really shifts you away from that language of accomplishment toward a language of the self. BLOCK: What do you think Katharine Briggs and her daughter, Isabel, what would they think about how their creation is being used now? EMRE: Well, Katharine would have been appalled. She was never a fan of Isabel actually transforming her theory of types into a questionnaire in the first place. She believed that she had spent so much of her life studying young and that the only way you could really type somebody was being initiated into his thinking over a very long period of time. And so she was sceptical of the questionnaire from the get-go. I think Isabel Briggs Myers would also be quite disappointed. And I think she would have felt quite sad by how, you know, people can just take knockoff versions of it online, how quizzes like Buzzfeed quizzes basically parody the logic of type by saying things like, you know, by asking you which Taylor Swift song reveals something about which "Friends" character you might be. And I think she would be quite disappointed by how loosely and what an unregulated fashion the indicator was allowed to circulate. And I also think she, you know, her primary objective was not to make money with it. She wanted it to truly be useful to people, to help them figure out what it was that they should be doing in their lives because as a mother and a wife herself who often felt like her potential had been thwarted, that emerged to her as one of the most important questions that anybody could answer. BLOCK: That's Merve Emre. Her book is "The Personality Brokers: The Strange History Of Myers-Briggs And The Birth Of Personality Testing. Merve, thanks so much. EMRE: Thank you, Melissa. Transcript provided by NPR, Copyright NPR.